Last night was the Parent Student dance at Benjamin's school. Doesn't he look so handsome in his suit. He was very excited to wear a real tie, not one of those little kid clip on. Mommy had to look up directions on the internet of how to tie a tie. Isn't my date handsome! He even danced with mommy a few times before his friends got there. He can really dance. One of the dad's there asked me if he had taken lessons. Here he is with 2 friends from class. You can tell the he's really moving. Benjamin can read almost any word that can be sounded out. He already knows all 200 of his sight words that he is supposed to learn by the end of the year. But he does not read very fluently and his comprehension isn't the best. So mommy instated a new rule yesterday. It was a half day and I told him that to get to use any electronic device (tv, computer, DS, Netflix, or Granny's tablet) he would have to read. 1 page for 1 minute. Mommy thought she was being so smart. This way the time he spends looking at the pictures would not count towards tv time. So, Granny took Benjamin to the library to pick out some books. Benjamin picked out his own books. There were very few words on the pages. That way he didn't have to read many words to get his electronic time. Mommy is now going to have to specify that there must be at least 10 words on a page for it to count. I doubt this is going to go over very well. I'm still not sure if he doesn't have good reading comprehension or if he just feels no need to tell you about what he just read to you. With him it could go either way. 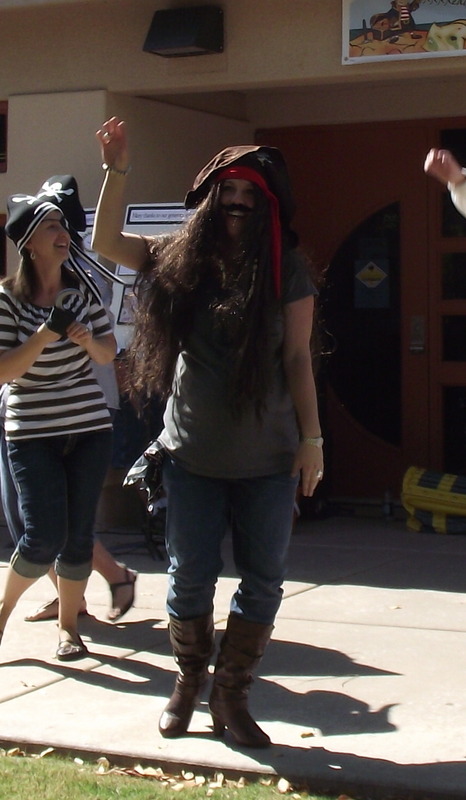 This year's Read-a-thon was a Pirate theme. He asked Granny, Uncle Bill, Aunt Krissy, and mommy to sponser him. Benjamin really enjoyed the reading and being read to during the read-a-thon. Last year Benjamin was the most read Kindegardener and was slightly tramatised by the experience, but this year he said he wanted to be most read 1st grader, so him and mommy read. We read 6 - 400 page books (Charlie Bone series) and a lot of little books. Needless to say, Benjamin was the most read 1st grader at 3960 minutes (66 hours) in 2 weeks. He was also the highest money raiser in 1st grade. This is all of the top readers & money earners for each grade. The students raised over $15,000.00...so Mr. Miller got wet. Since Benjamin was top reader & money earner he should have gotten to throw 2 buckets, but they didn't let him. They let the girl in 2nd place throw one of them. He noticed that wasn't fair, but he hasn't gone on too much about it yet...I'm guessing we will be discussing the unfairness of it in a few weeks. Here he is with the list of top readers. His is the first name by 1st grade. And here he is with the top money earner list. Benjamin's class was also the top reader & top earner 1st grade class. Last year we had a little problem with the teacher that Benjamin was assigned to. I had spoken to the principal before summer started and we decided he would have Mrs. Pfeiffer. Then the day before school started he was in the wrong teacher's class. The principal was too busy to speak to me about fixing this mistake, so I did the only thing I could...me & granny went to the district to get his teacher changed. I am sure a lot of parents would not have gone to this trouble, and most people think I was crazy for doing it...But it was the absolute best thing I could have done because Benjamin's kindergarden teacher moved up to 1st grade this year and the whole class got to stay with her. She is a wonderful teacher and he loves to go to school and see her. The parents of her class would like her to move to 2nd grade next year. And so would the kids. That is probably because this is what she was willing to dress up like for the assembly today...notice what the teachers behind her are wearing. Who wouldn't love her. Kenzie, I think this is Mr. Hardy as a cowboy pirate. Well, I just have to share the news with everyone..........Little Benjamin read his first book tonight!!!!! He's so proud of himself. He will be starting kindergarten in the fall. He can't wait. He really wants to read books. Mommy is so proud of him. We called Granny, Aunt Krissy, Uncle Bill, Papa, and my friend at work to let them all know he read a book. If I could think of anyone else to call, I would. Granny did a good job of picking out an outfit for me. 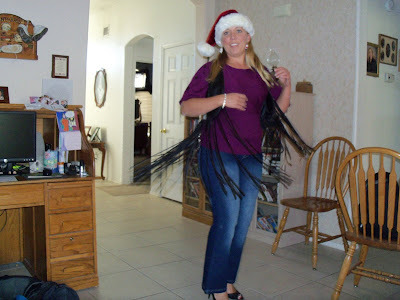 I love the fringe vest. 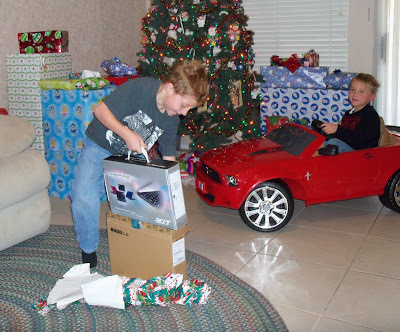 Benjamin really wanted a race car for Christmas. 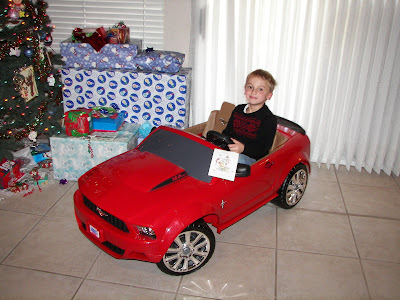 Granny & Papa got him this red convertible. 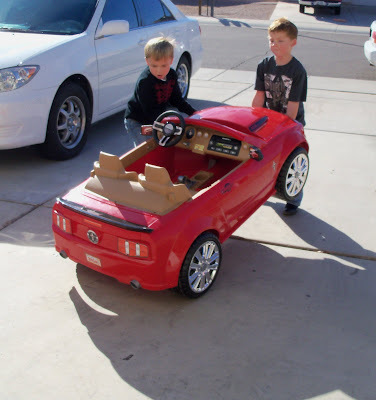 He says it's just like Granny's car and he loves driving it around. 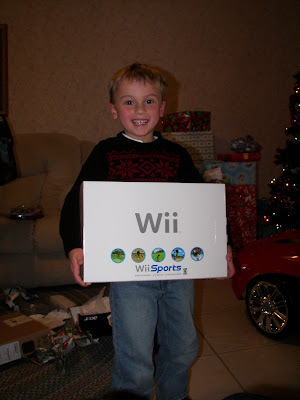 Santa decided that Mommy needed to have a gaming system for the boy, so he brought a Wii to Granny's house for mommy. I have a feeling that if I tried to return it to the store I wouldn't get anything next year. And what good would a Wii be with out a new flat screen TV to play it on. I'm not sure where I'm going to put it since I already have 2 TV's. It's been a good Christmas for the Lawless'. We both made a haul this year. Merry Christmas!!!!! Benjamin said that if mommy was really good this year he was sure that Santa would bring her presents. Well, mommy must have been because Santa brought her jerlery. Benjamin helped mommy open her presents. 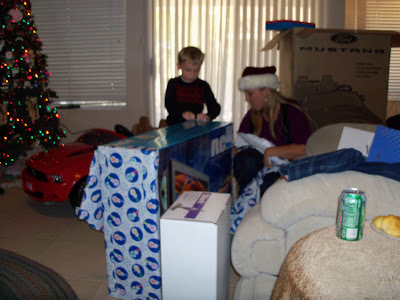 He was really happy that mommy got a new portable dvd player. I won't let him have a TV in his room, but ever now and then I'll let him use the portable and lay in bed to watch a dvd. But Amanda broke ours in August, so the boy hasn't been able to watch TV in bed at all. The boy was really good this year. Look at that stocking. It was mostly full of track suits and PJs. But he had fun unwrapping them. A new bike!!! Santa forgot to get him a pump for the tires. Unfortunately Santa also forgot to put air in the tires. But its ok because Papa has 2 and were going to bring 1 of his home with us. This is the first of Benjamin's 4 Christmas' today. Next is over to Granny's. 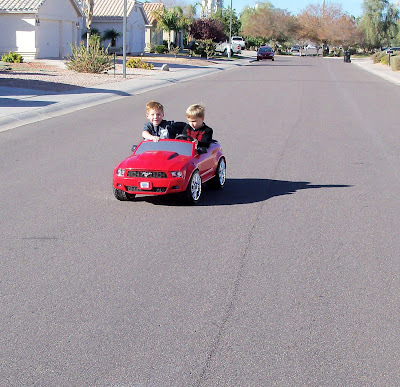 Well, its our job to pick up Austin and take him to Granny's, so we better get going. MERRY CHRISTMAS!!!!! It's Little Benjamin's World and he let's mommy live in it. Almost everything I do revolves around my son, and I love it that way. I have a sister and a brother and 7 nieces and nephews. Granny lives a couple of miles away and Benjamin loves that.